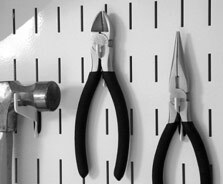 Wall Control is committed to being the industry leader in pegboard style storage & organization. Simply put, no other tool storage system can match the quality, versatility, and value of the award winning Wall Control System. Our commitment to quality is not only reflected in our product but is also evident in our practices. We strive to do right by our customers every day, starting at product design conception and continuing through with superb product and customer support. Being committed to quality means keeping a close eye on product production to be sure that the Wall Control values are stamped into every panel and accessory that is produced. 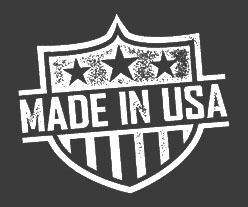 We achieve this by manufacturing our entire product line here, in the USA. Our story begins in 1968 in a small tool & die shop just outside Atlanta, Georgia. The first of three generations began their work in building a family based US manufacturer with little more than hard work and the American Dream. Over the past 50 years our patriarch has continued to grow and expand with what was once a fledgling tool & die shop into an award winning US manufacturer of products ranging from automobile components to satellite panels and now, the best wall-mounted tool storage system available today, Wall Control. 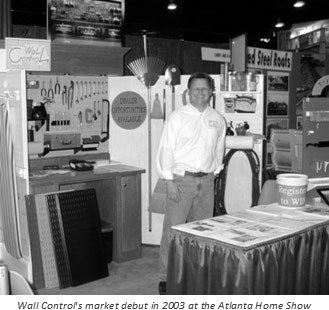 The Wall Control brand launched in 2003, and is a family owned and operated business that not only produces a high-quality American Made product but sees the entire design, production, and distribution process happen under our own roof in Tucker, Georgia. Under that same roof, you'll still find 3 generations of American Manufacturing hard at work to bring you the best tool storage products available today. 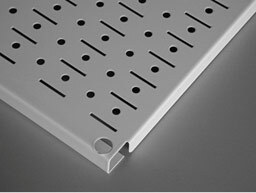 Durability - Our strong metal pegboard prevents the peg holes from fraying and wearing out over time. Traditional pegboard panels start out ugly, wear out quickly, and eventually the pegboard hooks no longer stay engaged in their peg hole and will fall out when the tool is removed. 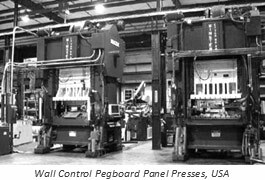 Our panel face, manufactured in the US from 20 gauge steel, ensures that Wall Control's system will last a lifetime; many times longer than traditional pegboard products. Versatility - Our unique "Combo" style panels allow the user the option of utilizing 1/4 in traditional pegboard hooks as well as our own patented, much more secure, "double offset" hook and slot design. Wall Control's metal panels are also magnetic so you can attach all your magnetic accessories as well. Engineered for both secure engagement and ease of movement, Wall Control's Hooks, Brackets, Shelves, and Accessories will install easily and stay put. The versatility of these storage panels is also highlighted by the all-steel shelving system that Wall Control panels support. Finally, a pegboard system that has the ability to support substantial weight on a matching, integrated shelving system. Ease of installation - Wall Control installs in minutes. Ease of installation was a key criterion during the design phase of this pegboard system. Manufactured with a built-in flange on all four sides, the Wall Control storage panel requires no pre-built framework and mounts directly to any flat surface. The flange spaces the panel's perforated face away from the wall so that the hooks, brackets, and shelves will engage with no wasted area. The convenient 16"x32" standard size and modular design make it easy to handle and a snap to install. If you have traditional 16" stud spacing, you can hit studs all the way down your wall with Wall Control's brilliant mounting hole instructions. If not, have no worries, we include drywall anchors as well, so hitting studs is not required, although obviously preferred, if possible. Wall Control storage systems are the industry leader when it comes to pegboard tool storage and organization, and for good reason, but don't take our word for it. We encourage you to check out our online product reviews from reputable places like Amazon and Home Depot to see for yourself that our products truly are in a league of their own when it comes to quality, versatility, value, and ultimately, customer satisfaction.